This comprehensive resource assists in the development and strengthening of integrated human milk bank systems worldwide by providing critical tools for ensuring safety, quality, and sustainability. The toolkit includes 11 guides with templates, standards, and tools, which focus on readiness, quality assurance, operations, auditing, training, monitoring and evaluation, and communications. If implemented as a component within a comprehensive and integrated system, human milk banks can also serve a broader purpose for protecting, promoting and supporting breastfeeding, embedded within both nutrition and newborn care programming. Each interactive guide is equipped with appendices and hyperlinks to related resources, examples, and templates. The content was developed to be as adaptable as possible to local contexts around the world. The entire kit is free to the public and globally accessible online. 0. 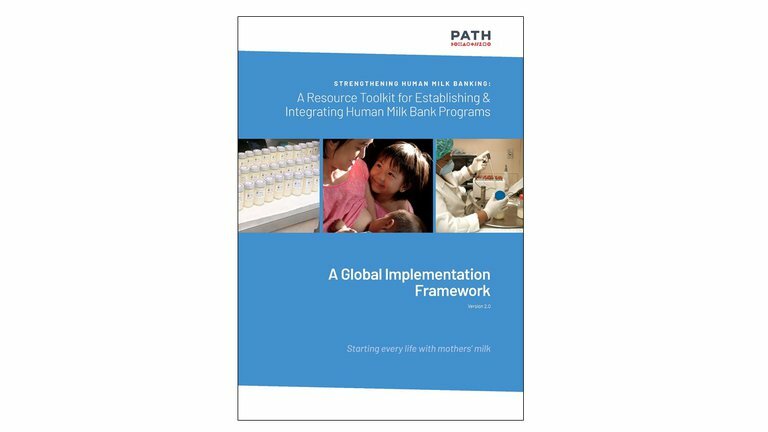 A Global Implementation Framework, Version 2.0: Resource toolkit base document, outlining core requirements and quality principles for human milk banks globally. 1. An Assessment Tool for Determining Facility Readiness: Pathways for decision-makers to assess readiness in creating comprehensive, safe, and integrated systems. a. A Workshop for Developing a Hazard Analysis Critical Control Points (HACCP) Plan - Trainee Workbook - Trainee Workbook: Interactive HACCP training workshop to guide development of site-specific HACCP plans to ensure safety and quality. b. A Workshop for Developing a HACCP Plan - Trainee Workbook - Trainer Guide: Interactive HACCP training workshop to guide development of site-specific HACCP plans to ensure safety and quality. c. A Guide for Creating Operational Standards: Templates to facilitate the development of locally appropriate quality assurance guidelines and national standards. d. An Audit Template: Template to facilitate the self-evaluation of standard operating procedures, staffing, equipment, and infrastructure. 3. A Guide for Conducting Monitoring and Evaluation: Guidance and templates for developing research systems to generate evidence documenting operations and outcomes impact. 4. A Training Curriculum Template for Hospital and Human Milk Bank Staff: Template to facilitate the development of locally adapted training curriculum for hospital-based integrated systems. 5. A Guide for Track and Trace Documentation: Step-by-step processes for quality tracking and record keeping with templates for logs, forms, and registers. 6. A Guide for Developing a Communications Strategy: Guidance, examples, and templates for establishing communications messaging for integrated and comprehensive systems. 7. A Counseling Guide for Engaging Bereaved Mothers: Resources for healthcare workers to appropriately and sensitively discuss lactation options for bereaved mothers. HMBANA contributed to the development of these resources by attending workshops, reviewing materials, and contributing their expertise in a variety of areas across the toolkit. As demand for donor milk continues to grow annually, so too will the need for important resources such as these. Congratulations to our partners at PATH for a job well done!